Do you ever hear of a news story that makes you think, wow, humanity is truly victim to its own stupidity and we are essentially doomed? Who am I kidding, that is almost every news-cycle. I just came across a story that made me want to run from my laptop screaming. Not because it is macabre or emotionally upsetting, but simply because I can’t believe it has come to this. 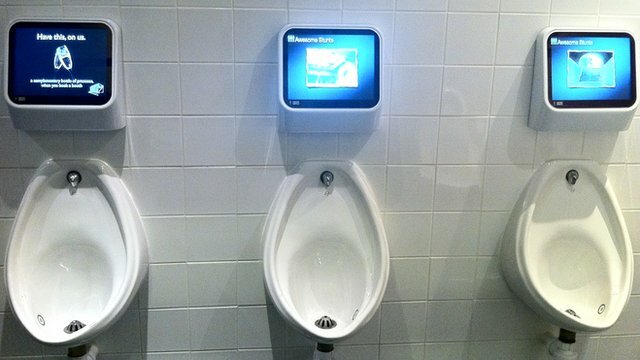 A company in England (and of course Sega in Japan; Japan is always first you realize) has created game consoles for the public urinal controlled by, you got it, a man’s urine. Yes, you heard me. Apparently men spend 55 seconds on average in front of the urinal and that is simply too much time to sit alone with one’s thoughts whilst staring at one's shoes (or envying the man next to you – oh go on, you know this takes place). Basically this hands free device (cause touching anything would just be gross) has a console above the urinal that is controlled by where a man pees within the urinal. By use of infra-red sensors at the bottom of the bowl, a man then aims for marked targets by peeing on them with his own 'joystick,' if you will. Yes, it is that crass. So far the games consist of a skiing game and a pub quiz. I’m sure they are fast developing about 300 more games as we speak (who needs to cure cancer when we have people hard at work creating urinal video games). Once a man has finished playing (and peeing), he can post his scores to twitter and a live leader board. Cause what would make your mother prouder than you getting the high score playing a urinal game. Oh King, how I pray you aspire for higher accomplishments. The console is also going to be used for advertising, be it the bar that you’re using the toilet in, or various food or drink possibilities. Cause we are truly not safe from advertising anywhere. The thing is this, I get it, we are a highly technological culture that is inches away from living in some overstimulated sci-fi film; but, and this is a BIG but, if you can’t spend 55 seconds on your own in a public bathroom without being entertained, then I’m not even sure what to say to that. No wonder we are fast becoming an illiterate, uneducated, violent society. Furthermore, the bathroom is the last place I want to spend time, especially a public restroom. Seriously, ewwwwww. Sorry eloquence escapes me. Not to mention, you think couples fight now because of a PlayStation at home, can you imagine the public arguments that will arise because Mr. Video junky can’t leave the public restroom until he gets the high score while his family waits outside for him [cause you know they will never have the same advancements in the women’s toilet - not that we need them. We don’t even get more than two stalls]. So for those of you that think this is a good idea, go read a book; take a breath; stare at a wall, anything. Just take a moment to remind yourself that you are able for 55 seconds to do absolutely nothing...but pee that is.